OTTAWA — “I’m not very fond of meetings. 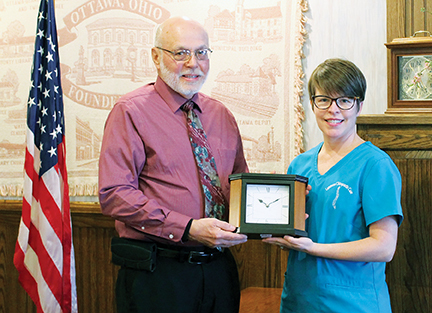 It’s more like, give me a tool and let me get out there and start working,” said Dr. Ronald Black, after receiving the 2019 Community Service Award from The Ottawa-Glandorf Rotary Club for his extensive contributions to his community. As related by many, Dr. Black was instrumental in securing monetary and material donations for the improvements to Memorial Park and the creation of the Rex Center in downtown Ottawa. However, Dr. Black seemed to be somewhat in disagreement with the recognition. “There are not enough names on here,” he insisted, multiple times. He mentions Andy Schroeder donating all of the electrical work for the new lights in Memorial Park. Nelson manufacturing providing the steel for the Rex Center at cost, and then donating the additional work needing to be done in it - all of the fabrication - the sandblasting, drilling, and welding. He complimented Bockrath and Assoc. for the surveying work done for the Rex Center, and Denise Balbaugh and Barb Hermiller for going to FEMA for expedited approval, and returning with grant money for the project. Don Croy donating his time and expertise in landscaping. K&L was approached for bricks for both the Memorial Park and Rex Center projects, and ended up also donating all of the foundation blocks, cement for the pillars and more. Workers from the Village of Ottawa used their lunch break to donate much needed labor, exactly when it was needed. In 1972, Dr. Black graduated with honors and as President of his class from the Palmer College of Chiropractic in Iowa with a Bachelor of Science degree and Chiropractic degree. He opened his practice that same year. As a Glandorf Garden Club volunteer, Dr. Black was instrumental in the installation of miniature golf in Glandorf Park, and he has been named a Distinguished Citizen of Glandorf. Dr. Black also serves on the Board of Directors for Paulding Putnam Electric. He and his wife Linda raised two children, Matt and Jodi, and between the two they now delight in their four grandchildren.